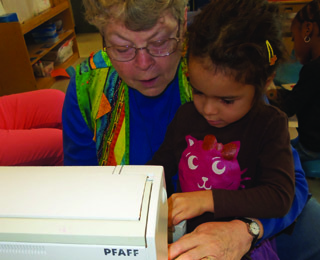 Every day, young and old come together for a spirited, often educational activity at Kendal at Oberlin. Pre-schoolers and residents gather in the Country Kitchen to cook; meet in the Care Center and Gathering Room to sing, play games and paint; and settle down in the Early Learning Center to read books. Now, thanks to a new outdoor certification from the Ohio Division of Wildlife, more intergenerational activities loom on the horizon. As a WILD School Site, which is an extension of the national Project WILD program, the Early Learning Center is designated as a place to learn about and benefit from wildlife and the environment. A $500 state grant will be used to build a sensory garden outside of the horticulture building for both residents and children to enjoy. Other ideas include rain walks and bird outings for all ages. “Our goal is to have a weekly project outside,” said Jeni Hoover, director of the Early Learning Center. Last year, Jeni and her staff studied the WILD curriculum, and in early 2016 applied for certification. State officials visited Kendal in August to make it official. Before presenting the WILD School Site Certification, Jamey Emmert spoke with the preschoolers, who sat attentively on the bank of Center Pond. The pond, located in the center of campus, depicts nature in all its glory, with abundant flowering lily pads, blue-green reeds and a family of ducks. Jamey, with the Ohio Division of Wildlife, asked the children what the difference was between pets and animals. Lots of hands went up. She explained the importance of caring and protecting wildlife, and lots of little heads nodded in agreement. After the ceremony, Jamey and her colleague Ken Fey made fishing poles from sticks, fishing lines, bobbers and hooks. With bait attached, the children and their teachers found spots around the pond to cast lines. Many residents, including those involved with the John Bartram Arboretum, were on hand for the festivities. The Arboretum designation is also new this year. The 100-acre campus, with more than 1,100-planted trees and eight ponds, was accredited by ArbNet as a Level 1 arboretum. Interpretative tags are being added to planted trees and a web-based catalog listing all trees planted with GPS locations and observation notes is underway. The Arboretum Subcommittee is also developing activities with the Learning Center, along with the City of Oberlin, Oberlin College Environmental Studies Department and the Ohio Division of Forestry. The first annual Arbor Day celebration was held in April. This summer, early learning teacher Mary Balduff attended a Natural Start Alliance conference in St. Paul, Minn., and returned to Kendal with lots of ideas for bringing children and residents together outdoors, in a group and one-on-one. She also has a wish list: children’s binoculars; rain boots and coat; and a pavilion with a shed for storing equipment and toys. For the pavilion, the center is applying for a grant. At the conference, attendees visited four pre-schools, including one located at a retirement community. Children spend an hour outside and an hour involved in an intergenerational activity daily. At a pre-school housed in a nature center, children cooked in an indoor and outdoor kitchen, and at the farm-based school played in the same pasture with llamas and other animals. “It really gave children a healthy respect for animals,” Mary said. At Kendal, children take care of two gerbils and enjoy visiting the residents’ dogs and cats. A handful of people, both residents and staff, met to brainstorm. The result? Another Kendal intergenerational program, this one held in the dining room. For the Mad Hatter Tea, the children made hats, the staff baked cookies, the resale shop donated plates and saucers, and the residents dressed in costume. The “Duck for President” book was a chance for one resident to blow a duck whistle and children to pick their favorite duck for president. This summer when a resident turned 100, the children stopped at his apartment to sing happy birthday.